WORTHING Football Club made it back-to-back wins over the bank holiday weekend with victory away to Peacehaven on Monday. Rebels won the Ryman League South Division match with first half goals from Harvey Sparks and Steve Metcalf. Sparks opened the scoring in the fifth minute with a low strike into the bottom right corner. Worthing doubled their lead in the 33rd minute when Metcalf fired home after a parry from the Peacehaven keeper. Callum Overton shot just wide of the post as Rebels searched for a third, while Worthing always looked comfortable at the back. Rebels joint manager Jon Meeney said: “It was a perfect weekend of football for us with the wins on Saturday and Monday, so we’re very happy. “We were always in control and played our game. They had a couple of entries into our final third but we stood tall and were resolute. Rebels moved up to 12th in the table with the win – with a third victory in six league games this season. 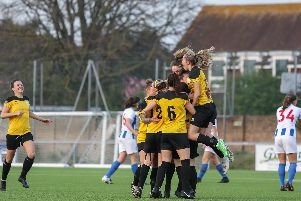 Worthing entertain Whitstable in the league on Saturday, before they travel to Three Bridges on Tuesday. WORTHING: Banks; Hendon, Hurley, Heath, Metcalf; Overton, O’Neill, Axell, Sparks; Bugiel, Pope. Subs: Dawes (Sparks 72), Morey (Pope 80), Quirke, Piper, Buckland.